Paul: I went with the dress. It was cheaper. HELLO, ladies and gentlemen, boys and antiboys. 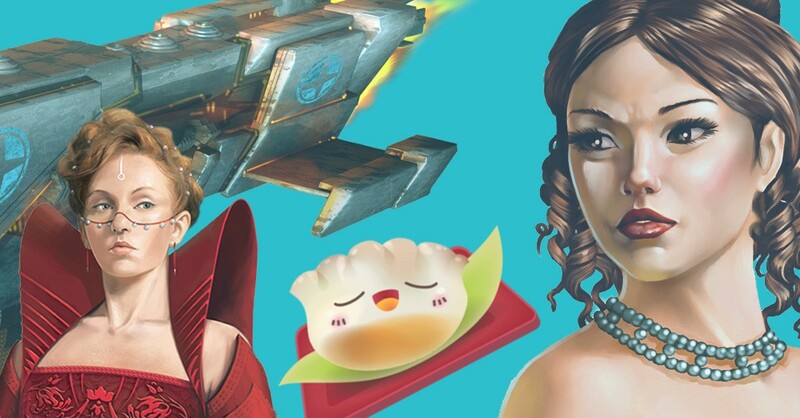 It’s time for our top 5 games of 2012, which will almost certainly be as well-organised and halcyon as our top 10 Upcoming Games of 2012 feature, which ended up being 14 games, none of which we agreed on. Quinns: SU&SD are HUGE fans of negotiation game The Resistance, where a table of freedom fighters and double agents must debate who to send on missions, and how to react when those missions are sabotaged (swearing and screaming, usually), so it was hard to imagine they’d put a foot wrong with Avalon. A semi-sequel with added features. Paul: Okay, I have no idea why this is in spot number five because immediately I can tell you it should be higher up and of course it should be here but it should be higher look you’re making me not punctuate and now I am hyperventilating. Quinns: BREATHE. Tell the people what Avalon adds! Paul: Well, this is the excellent thing. 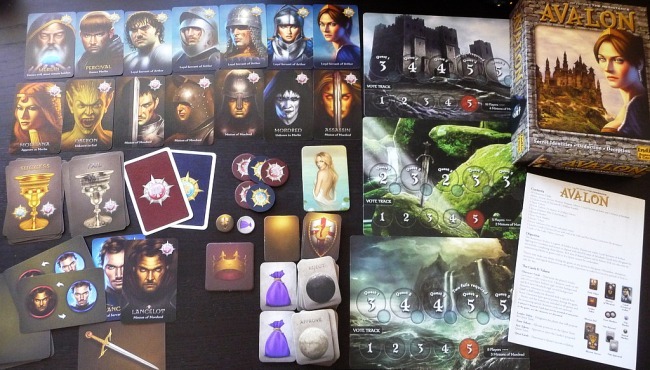 I’m not sure if I want to go back to vanilla Resistance now, because Avalon gives several of the players around the table special, game-altering powers which bring a new dimension to game. The plot is cast back to King Arthur’s court at Camelot and one of the good guys becomes Merlin. He knows who all the spies are, which gives him an edge, but if the spies are able to identify Merlin correctly when the game ends, they win, even if they were uncovered. Quinns: Yeah. Avalon basically turns The Resistance from a mathsy puzzle with an element of “HE’S LYING, LOOK AT HIS EYES / MOIST ARMPITS” into something from Jim Henson’s Labyrinth. “But if he’s Merlin… then that would make you Lancelot… and him Morgana…”, until your endlessly telescoping brain just falls apart. Quinns: But it’s just The Resistance, really. We can’t have a minor improvement on an existing game go dominating our end of year list. Paul: Well. Well. I think it’s a fairly big improvement to an excellent game and one that we said is a perfect introduction to board games. But let’s see what’s next on the list because the producer is giving us the signal with his hands. Quinns: Now we’re talking! Literally. Again. City of Horror is another game about talking. A spectacular grab-bag of game, with players trying to survive a zombie apocalypse by shuttling their survivors around, making the most of their dwindling reserves of equipment, and voting on who to feed to the hordes to buy the rest just one more hour in a doomsday machine of grudges and cunning. Paul: Wait, no, what? I mean, yes, sure, this is good, but we can only have five games as our best of the year. I’m sure the list I handed in had some different names on it. There must’ve been a mixup. 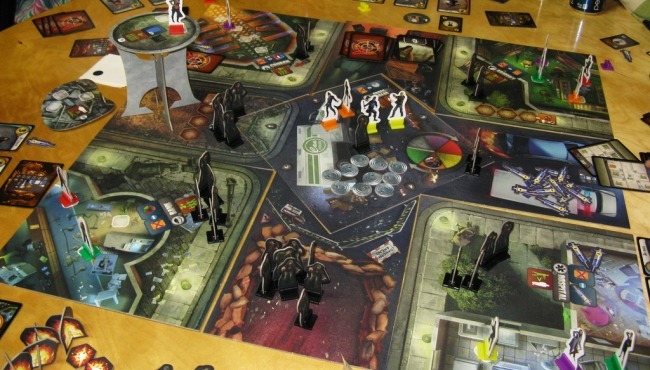 City of Horror is a fine game of fierce negotiation, and cold, calculated decisions. What’s more, it’s built upon the simplest of rules. It’s dead easy to get almost anyone into it and it ties you up in diplomatic double-knots as you argue why the characters under your control should be the ones to survive the zombie apocalypse. It’s very good. But I’d rate it just outside my top five which SOMEHOW seems to have been mislaid. Quinns: Tell you what. I’ll give you my top 5 reasons why this needs to be in my top 5. Quinns: One! It’s epic, while being comparatively quick. Two! It blends negotiation, logic, patience and puzzling, so it’s nuanced while remaining simple. Three! It can simulate a priest pushing a pregnant woman out of a water tower. Four! It reshuffles itself, with the survivors, cards and building tiles you get, so it’s always a little different. Five! It has a three-dimensional water tower thing. Paul: Is he still going? I’ve moved onto the ne- Ah! Yes. Yes! What a fascinating game. When we reviewed it earlier this year we warned you that it was an enormous, complicated and elaborate experience. It’s not an accessible game and it’s not an easy game, but it is absorbing, its full of clever mechanics and systems and it’s also a pretty damn fine lookin’ thing if you don’t mind me saying. The theme is one of epic fantasy and if anything gives you that sense of epicness, of epicality, of the epicious, it’s this. 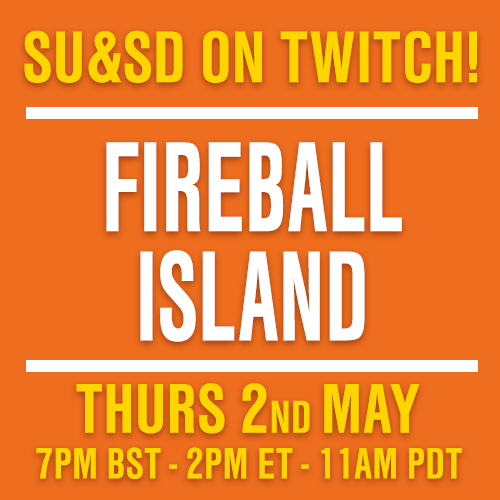 It’s part deck-building, with you gradually amassing cards that represent your powers, it’s part roleplaying, with you gradually improving your skills and abilities, and it’s part adventure game, sending you out to conquer citadels, to fight extraordinary monsters and to sack dungeons. And temples, too, if you want to be evil. Which you can! Quinns: Yeah. We marked it down for being such an absurd, intimidating machine, but as a machine, it’s geek clockwork. After you’ve spent the two hours familiarising yourself with it, perhaps having torn your through your first dragon like a pinata, any hardy nerd will find themselves staring in awe at the intricacy of the parts and how they all fit together. You said it in our review. This game sits you in the cockpit of a jetplane, and it’s as demanding, and rewarding, as learning to fly. For every gamer who can’t be bothered with it, it’s going to be someone else’s game of the year. Paul: I feel bad saying that it’s not for everyone, but it’s clearly not. 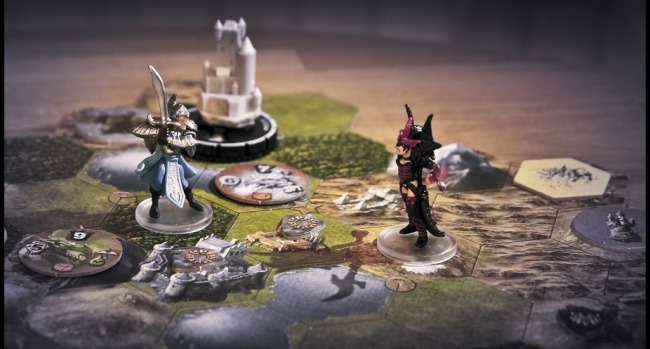 It has quite the learning curve and even seasoned gamers might be a little intimidated. But if you can get into it, and if you don’t mind your rules on the more complex side, then it’s definitely something you should play and very much one of our games of the year. Looks like we’re finally getting this list sorted. What’s next? Quinns: Proof that Paul and myself aren’t wizard-obsessed manchildren! Castles of Burgundy is a vintage game that emerged this year from the dusty cellar of a German’s mind all about growing your own personal French estate. Yes, we cruelly compared it to “The lovechild of a maths textbook and hotel room art”. I later said that if someone came to my house and put this on the table, I’d deliberately spill wine on it. We also told you to love it in spite of that. Paul: Castles of Burgundy is one of the best Eurogames I’ve played in quite some time, one of the best examples of its kind. 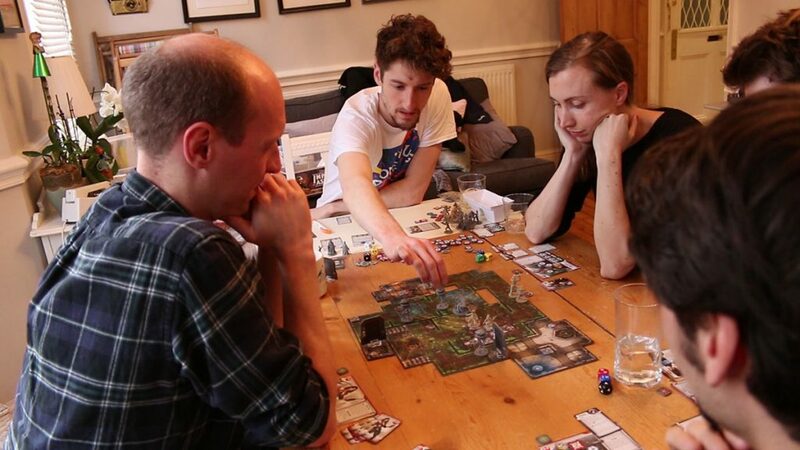 Eurogames, you’ll remember, tend to be light on theme and not the shiniest things out there, but their value is found in their perfectly-crafted mechanics, in the head-scratching they demand, in their balance and their replayability. 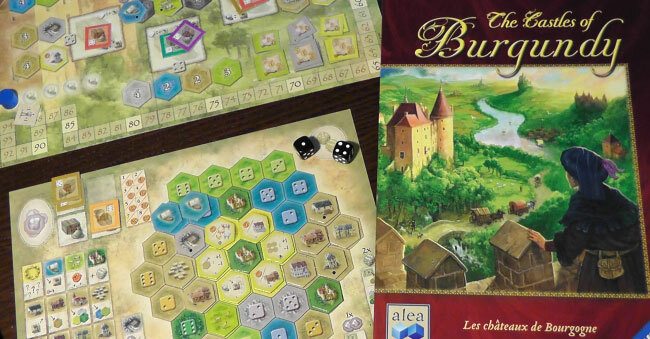 Castles of Burgundy demonstrates all of these things and while we’ve already played it several times over, we could easily play it a whole bunch more and never get tired of it. It’s an enormously engaging game that’s just full of stuff for you to do and there’s something brilliantly satisfying about gradually growing your own estate on your miniature board. Quinns: It all just works. Like Agricola you’re building something, but the game has a pleasant pace, rather than one full of worry and disappointment. The tender joy of completing a town. The excitement of placing a new castle! The forbidden thrill of amassing piglets. Quinns: OH GOD IT’S SO GOOD. It also technically came out in 2011, but so did Mage Knight. We’re going off when they landed in the UK. Quinns: We’re overwhelming fans of WW2 heroism-fest Memoir ‘44 here at SU&SD. A game where you’re one step removed from the battle, and your opponent, and you’re trying to bend the war to your will using the cards in your hand. A Few Acres of Snow feels like the next step up. A longer, richer, more epic battle, where your cards don’t just limit you, but actively surprise, enthrall and humour you. A Few Acres of Snow isn’t just a beautiful battle. It’s a challenge with its own personality, like a third participant in the duel. 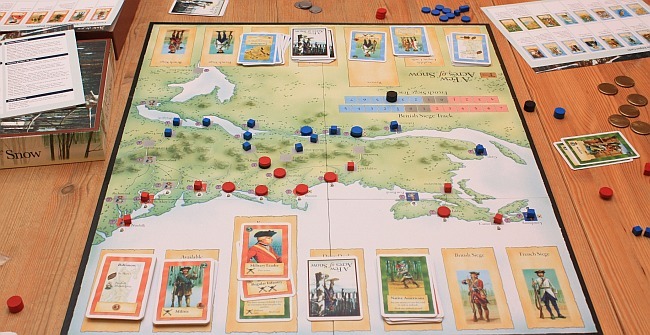 A battle where the map, the rules, and your opponent, all leave you wistfully remembering your time in Canada like a retired general. Paul: Well, yes, this is a great wargame and one with a mechanic that is quite possibly borderline genius. I think I remember finishing my first game and stepping away from it to wonder what just happened. It’s exhausting, but in a good way, because as you build a deck that represents the war machine you’re creating, with all its troops and resources and bureaucracy, you’re similarly weighing yourself down with the complications of your creation. It’s such a smart idea and it makes for so many nail-chewing decisions and cruel, cruel compromises. Man, it makes you use your brain. Paul: That’s all very nice, but I don’t think it’s the game of the year. We should probably go back and edit this. Something’s gone wrong. Quinns: Oh, we’ll go back. Back… TO THE FUTURE. Paul: WHAT HAS HAPPENED? What’s that noise? Is that ozone I can smell? WHY ARE YOUR EYES GLOWING. Quinns: Now, you haven’t played this, so you just ask me questions about it. Ask the questions a reader might ask. Paul: OH GOD GET ME OUT OF HERE Okay so what is this game then. Just don’t hurt me. Quinns: It’s a re-launch of a game in the 90s by Richard Garfield, who designed Magic: The Gathering AND SU&SD favourite RoboRally. Now, I’ve /heard/ that Richard Garfield was, in hindsight, disappointed by Magic’s inability to live up to some of the fun of playing poker. Magic isn’t always about how you play your cards. 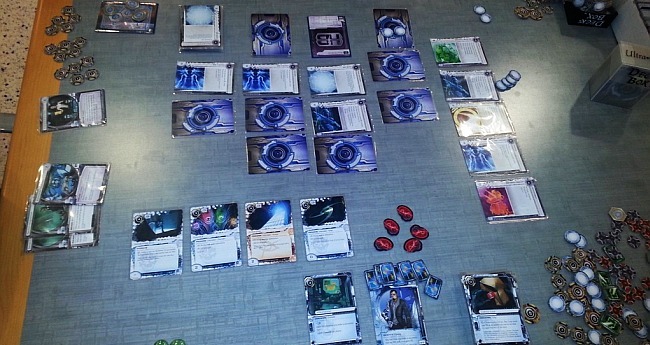 Netrunner was his attempt at fixing that, and it’s an unsettlingly entertaining card game set in a cyberpunk, Blade Runner type world. One player is a hacker, with one kind of deck full of programs, hardware, energy drinks and illegalities. The other player is a corporation, with a deck full of intrusion countermeasures, employees and projects. But it’s a game of ruses and bluffs. The corporation has to successfully run projects without the hacker stealing the sodding things, and the hacker can go poking around anything, from the corporation’s private servers, to your hand, to your deck, to your discard pile. It’s beautiful. Paul: I don’t understand. Where did the walls go? Where’s the producer? Why do you have tentacles? Okay, okay! So, erm, it’s not quite a deck-builder? What’s so good about the game mechanics in this one? Quinns: This can wait for our proper review, but basically? Both players get to do something incredibly fun. The corporation plays like a corporation. You’re buildings walls, laying traps, perhaps leaving openings where a curious fly might come buzzing in. Meanwhile, the hacker plays like a daredevil criminal. Shaking tags on his location, slipping past security by the skin of their teeth. Paul: Something’s gone wrong. We can’t feature one that we haven’t even reviewed! I protest. Plus, the games aren’t even in the right order and this… this isn’t London. And I don’t know what’s happened to you. I’m leaving! Quinns: Paul. Do you feel that? Something’s… no! Impossible! Paul, we’re going back up! Quinns: Paul, we need to SIT UP & SHUT THIS DOWN. Paul: OK, you close down the server! I’ll handle this. R.E.X. 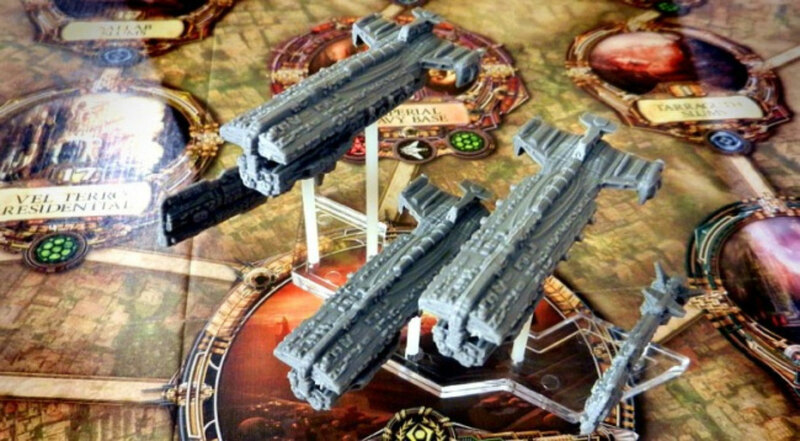 is the reimagining of the classic board game Dune, or one of the Dune board games, but with Fantasy Flight changing the location from the planet Arrakis to Mecator Rex, the central planet in their own Twilight Imperium universe. 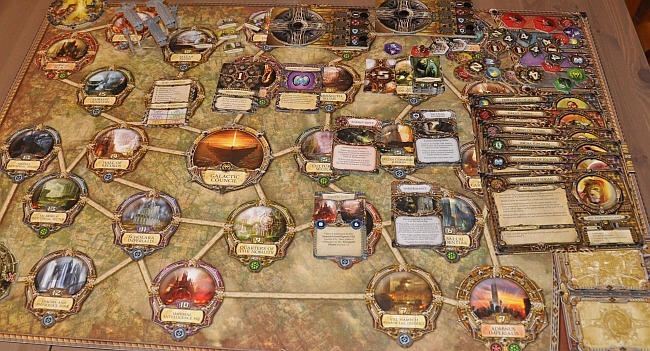 The players will be wrestling for control of the planet, trying to conquer the most important locations across the game board, and everyone takes control of a race that has a unique special power. That means all of you get to do something that nobody else can. What’s more, your special powers will inevitably, inevitably step on the toes of the other players. For example, one race is the arms dealer of the universe, and whenever players bid to buy equipment, they’re the one who collects the profits. Other players can collect political influence in the same way, can have knowledge of in-game events before they’ve happened, or can even sit out battles they know they’re going to lose. You all get to ruin someone else’s day and you usually get to do so at least once per turn, every turn. You fox, you. Quinns: Last year Paul and I were grumbling harmoniously about Fortress America. We could tell it was based on an archaic 1980s board game with some rudimentary mechanics, and we had little time for it. R.E.X., then, is an odd one. Unquestionably one of our games of the year, it’s based on an even older game from 1979. And yet it works so well. This time, the foundations of the old game are simple, strong and plausible. Because the game is so simple, every troop movement, battle and ceasefire see players threatening, discussing and forging alliances. Everyone is interested in everything else everyone is doing. And yet R.E.X. also represents a kind of candy shop of everything that ages beautifully. Hidden information, asymmetry, negotiation, betrayals and tension. Paul: All of which come together very, very nicely to make a game that is one heck of a challenge, where every play will be different and which, surprisingly, is very easy to learn. Quinns: OK, my ISP says our internet will be down in the next 30 seconds. Paul: What happens then? Will that save us?